Heather holds both SGAIC and UKCC (angling) level 2 qualifications. 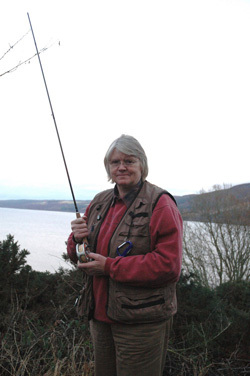 She has fished all her life and became Scottish Ladies Champion in 2006. She has extensive teaching experience which extends not only to fishing but also to painting and sculpture. She runs fishing courses on behalf of Inverness College, is the Single Handed (trout) Rod Instructor at the Highland Field Sports Fair at Moy and also a “Casting For Recovery” Instructor. Heather has been capped 6 times for Scotland and has fished at both international and Commonwealth level. Heather lives overlooking Loch Ness and enjoys teaching bank, boat and river fishing for trout, (both brown and rainbow). She will be delighted to help you in any way she can with casting, safety, choice of equipment, flies, fishing etiquette etc. She is particularly keen to encourage other ladies to become involved in the sport, she holds current First Aid Certificates and Enhanced Child Protection Clearance. Heather also produces her own range of fishing cartoon greetings cards!